In the past four decades, the Lord has continually opened doors of opportunity in nearly 135 countries. This includes private meetings and prayer with high-ranking Muslim and Hindu government officials. Her lectures on healing and the Bible have broken records for the largest public meeting ever held in that nation’s history, including Cairo, Egypt and Pakistan. The natural inclination to reach out, to celebrate people and culture, were traceable in Marilyn’s formative years; yet she had no idea how God would send her around the globe teaching the Bible and building bridges with people of all cultures and religious backgrounds. Year after year, they cross unfriendly borders with Bibles, teaching materials, and books translated into native languages, often at great personal risk. 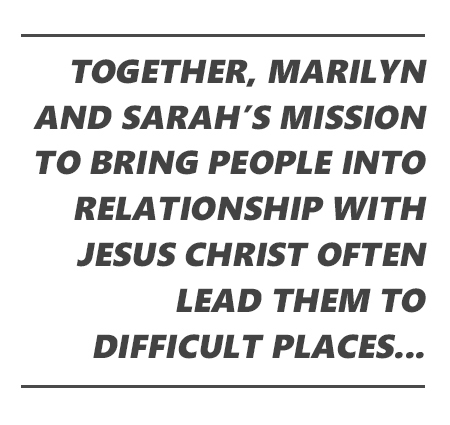 Marilyn and Sarah carry the gospel into scores of nations including Pakistan, Italy, Morocco, Ethiopia, Sudan, Russia, Panama, Australia, China, Germany, India, The United Kingdom, Vietnam, and dozens more. These reports will inform and inspire you!